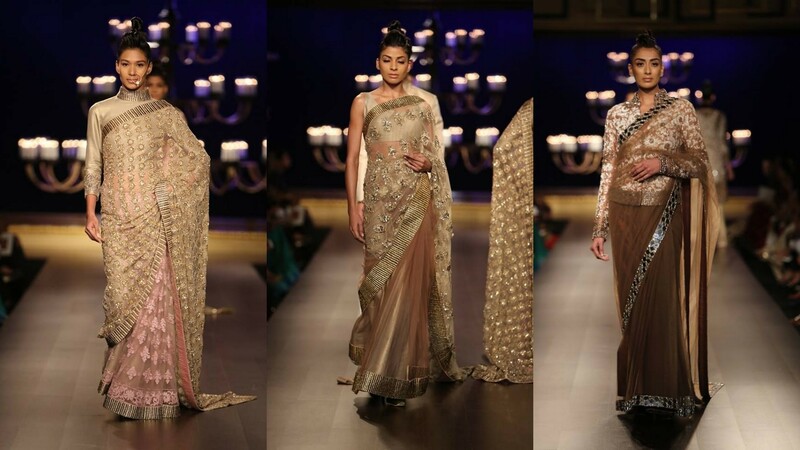 Seven gorgeous Diwali fashion trends this year that brings in the sparkle! Trends in fashion change over time, and that being constantly said, we are here to showcase a few trends this year that are going to bring in the sparkle like never before. Keep a close look at the fashion weeks and the B-Town girls for inspiration as well, which is what you would find as a fashion manna source. To make things happiest for you, we want you to sit back and relax, whilst we get the best of fashion trends under one roof for you- here are seven of them you should think about! Whatever be the mindset of the Indian lass, but when it comes to Diwali, she wouldn’t want to leave a chance wearing her gorgeous designer traditional sarees. From chanderis to silk, georgettes to chiffons and even maybe a touch of net, lace and velvet too, designer traditional sarees are going to be a rage in all colors and forms, draping styles too this time. What we would see here are plenty of embroidery and embellishments on net and lace, and if it is a solid hue, we can expect a play of silk threads and strands or pure silks ruling the season. Quite oxymoronish when we say ‘Indian western ethnic’, but that is how it is going to be for the Fall collection with PYTs just out of college or in college this Diwali. 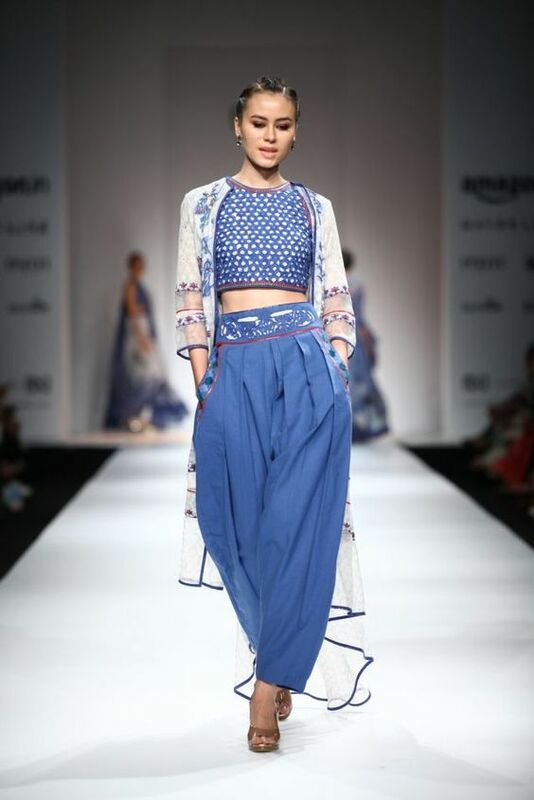 Expect cropped tops and harem pants being paired with chikankari trench coats or embroidered long asymmetrical coats. Solid hues mostly would be the in-thing for ensembles inside, whilst the coverings and layers would be embellished with plenty of embroidery and designs or appliqué and patchwork. We guess, the fabrics of chiffon and georgettes seem to be the ideal choice to beat the climes this Fall, which is why printed salwar kameez suits would be the in-thing for PYTs and homemakers to flaunt this season. Light and flimsy, layers or no layers, some with low necklines or high empire waists too; there would be a style cut out for each lass and lady celebrating the festival of lights. Dark hues with plenty of thread work and embroidery on them, in metallic tones and shimmers too would be the rage this Diwali. Suit up in V necks, boat necks or maybe with Square necks too, and you would be making heads turn, when dolled up the right way. Darker cool tones would take over the season of Fall 2016, it seems. This time with Anarkalis and you would notice many wearing them like there’s no tomorrow. Not that it would be common, but the right mix of solo cool or solo warm ombre toned Anarkali suits are going to make waves this Diwali. Ciggy pants worn with them are a must, but if you want more height, you could wear worked upon ankle-length leggings too. This is a timeless classy piece that can be worn for very formal events while the festival of lights are on. Solid hued summer jackets and coats, can be paired with gorgeous cotton or chiffon sarees and a fashion statement is thus born! With all the play on ethnic ensembles and Indo-western wear being spoken, we must not forget the importance of accessories. Chaandbaalis to jhumkas, temple jewelry to kundan sets, polkas to heavy neck-pieces and more. You need to have it large to be in charge! Get shopping from now and make your personality shine this Diwali!